For individuals that work from home, having a really good home office is invaluable – but how can the available space be used to best effect? In answering that question, it’s useful to begin by thinking about how the office will be used. Every home office has slightly different functions. If all that’s needed is space to write or use a computer, a small room with simple furnishings will often suffice, and it can be designed entirely around the user’s tastes. If the office is also to be used as a space to meet clients, it will need to look more professional and include suitable furniture for visitors to sit comfortably. It’s also important to think about any other work that needs to be done there. Should space be allotted for a printer, scanner or photocopier? Should there be an area for wrapping packages? How much space will be needed for filing cabinets? By considering all these issues at an early stage, it’s possible to design home office spaces that meet both of William Morris’ famous criteria – being useful and beautiful – rather than having to restructure them at the last minute to squeeze in things that were overlooked. When choosing furniture for the home office, the first thing to think about is the chair in which its owner will be sitting most of the time. This should provide plenty of support and should be adjustable; because shifting position from time to time helps the body cope better with prolonged periods of sitting. For visitors, luxury is the most important thing – leather sofas can look fantastic and are always comfortable to sit on, putting the client in a good mood whilst you negotiate with them. No matter how big a home office, storage is always an issue. Good quality filing cabinets are essential but they don’t need to look industrial. There are some very stylish modern designs out there as well as handsome wooden ones that suit a space with a more traditional look. Sturdy shelves are a must, as is a good desk that includes flexible (and secure) storage space. An ottoman can double as a window seat and is a good place to keep old boxes of files. Although it’s great to give it some personality, an office needs to look professional. This isn’t just for the sake of visitors; it’s also to keep its owner focused on work. If the room is small and it’s difficult to avoid crowding, sticking to light colours can help. Cool colours like blue or pale green work well in a white room. With a larger room there is a bit more space to be expressive and having one brightly coloured wall can add character and energy without making the place look unprofessional. 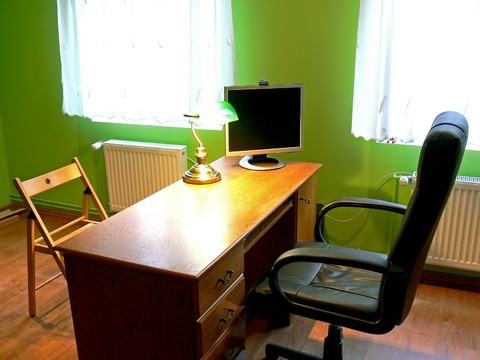 Having a separate home office helps to create a barrier between work and domestic life. It not only helps to keep the focus on professional activity during working hours, it means that when the working day comes to a close it’s possible to get away from it properly and to relax, without that long and boring commute.